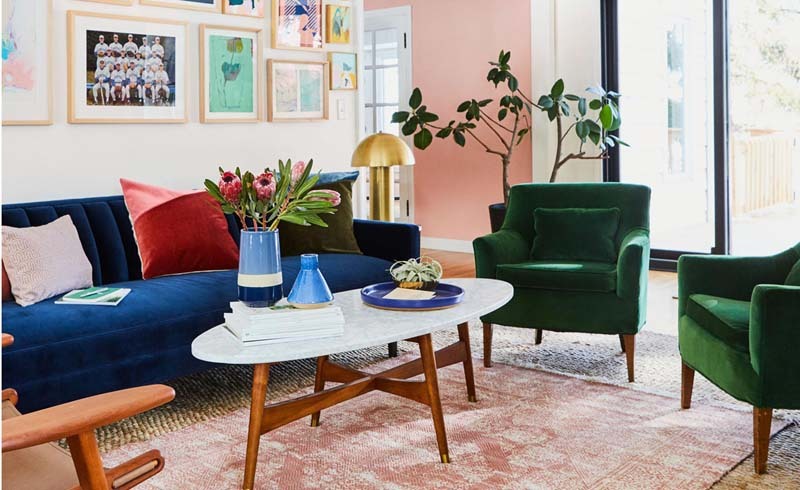 Erin Duininck's Minnesota home sparkles with individuality and color. 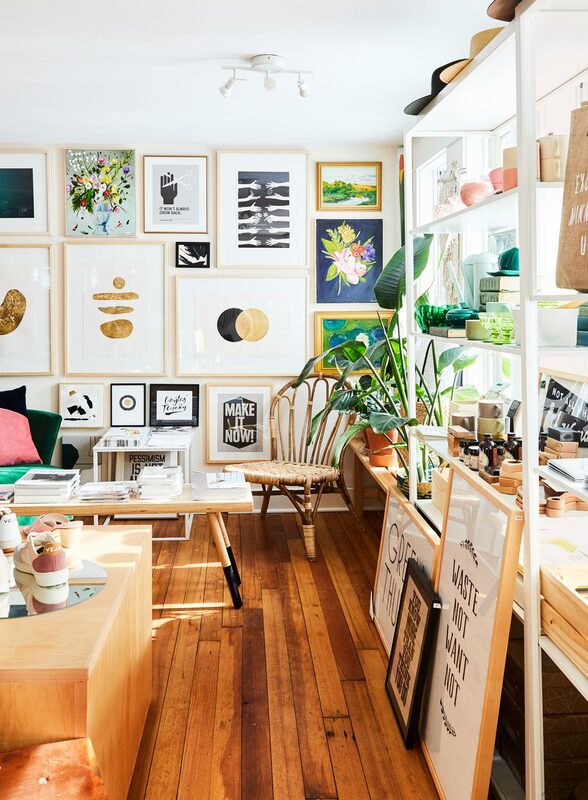 You'll find the same vibe at her boutique, Golden Rule, where Erin has nurtured a tight sisterhood of female artists and creatives. You won’t find a formal entry in Erin Duininck’s home. Step through the front door of her renovated 1920s lakeside farmhouse in Excelsior, Minnesota, and you land in the middle of her kitchen. “I knew I wanted to open it up,” Erin says. “We’re always entertaining. I love to host big family gatherings.” That family includes husband Ben, kids Lillian and River, plus the Golden Girls, a tribe of friends she’s cultivated through Golden Rule, her shop nearby. Erin likes to say she’s never met a stranger—even when she’s meeting a stranger. 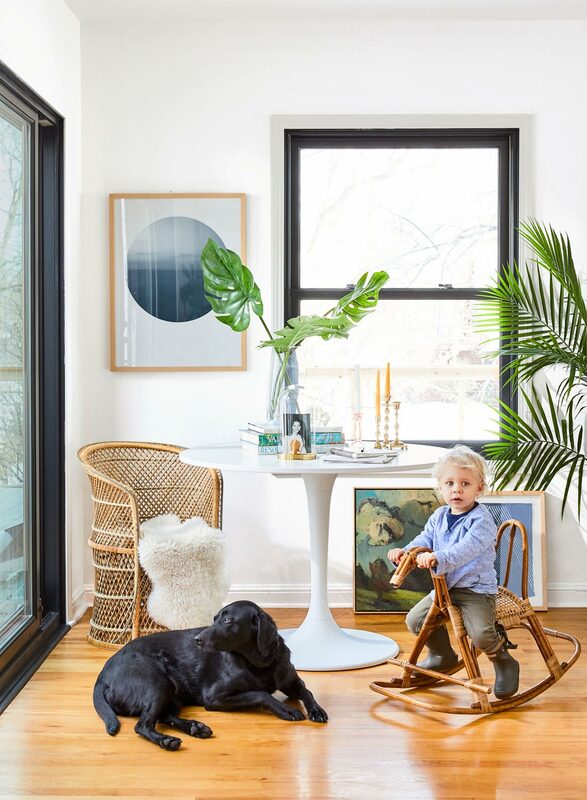 Erin's Excelsior, Minnesota, home is filled with artwork and other meaningful pieces. She opened Golden Rule in 2015 after years of heartbreak trying to have a second baby. “I decided to accept that it wasn’t going to happen and I would have a shop baby instead,” she says. Then, one week after opening the boutique, she found out she was six weeks pregnant with River. Friends Erin made through planning the shop started to help her out there. Later, customers began asking for jobs. A dozen or more women are in and out each week, dropping off products or working the counter. “The shop is kind of like a lighthouse,” she says, describing how Golden Rule has become a beacon for young female artists in greater Minneapolis. Which might explain why her home and her shop mirror one another. Just like at Golden Rule, Erin’s home is filled with eye candy. 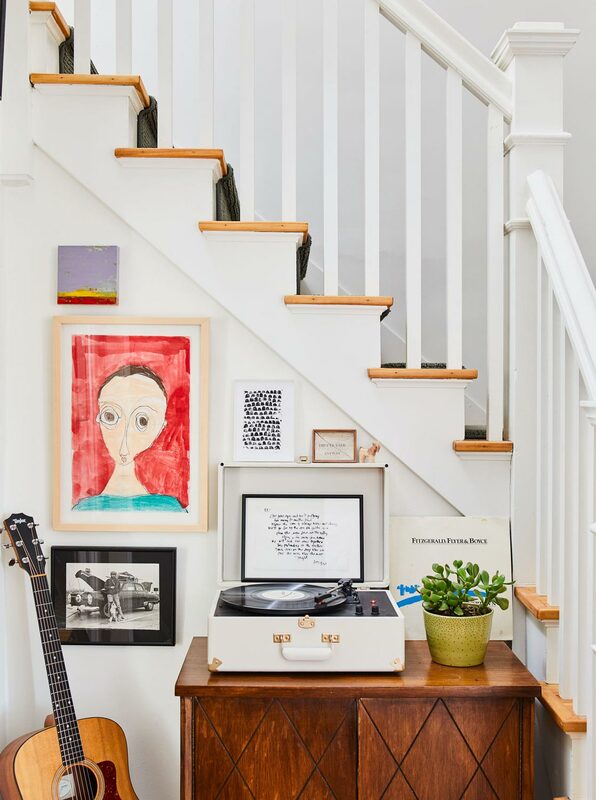 The walls are like time capsules, stories told through vintage paintings, her daughter’s art, handwritten song lyrics, letters, and sentimental objects like scissors, a childhood mitten and musical instruments. “I assign meaning to everything,” Erin jokes. “I’m notorious for bringing everything to my framer.” Some pieces show wear and patina. One framed quote, “They’ll Talk Anyway,” has cracked glass, and she happily admits that she’s not inclined to fix it. Erin prefers solid hues over patterns to highlight her treasures, but she doesn’t shy away from color. 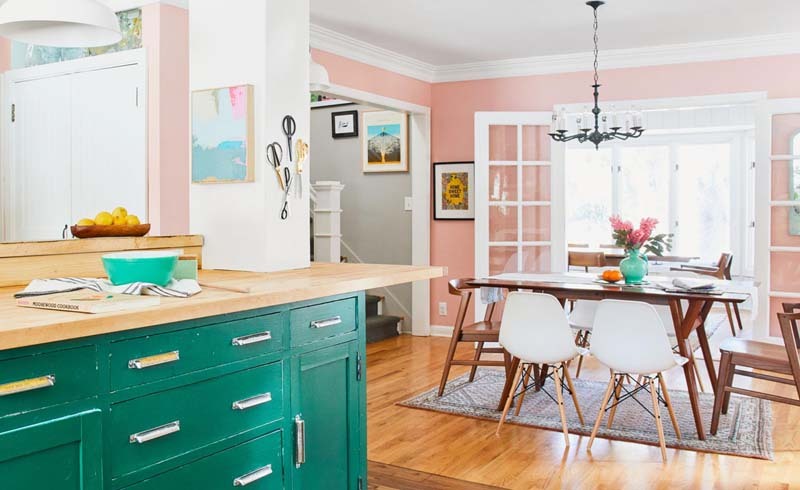 Her kitchen, for example, pairs an emerald island with blush-pink walls. 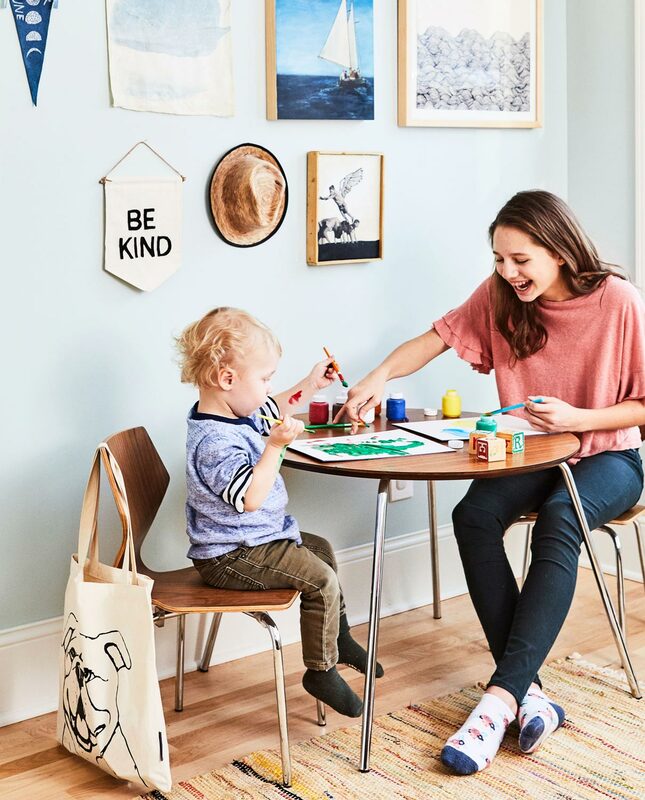 And, just as a shop shouldn’t be static—Erin repaints one display wall regularly in Golden Rule to keep things fresh—her home isn’t, either. Artwork and furniture slide around often to make room for new arrivals. 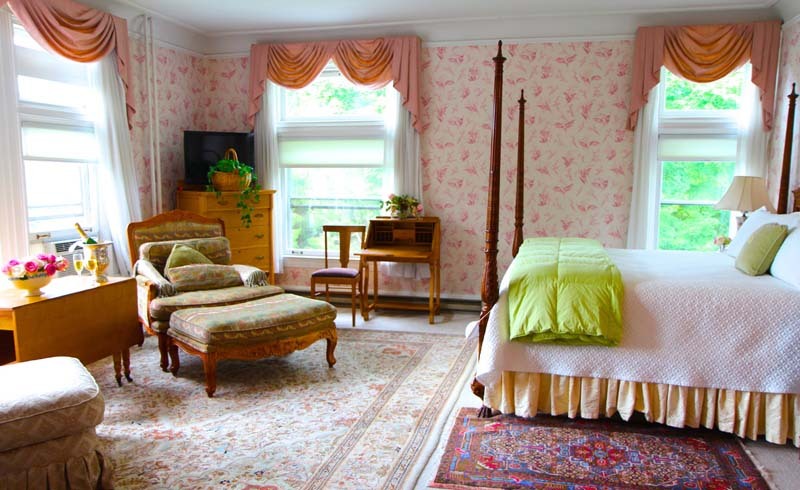 “My home is very nostalgic and sentimental. And I’m sort of just fine with that,” Erin says. Minimalism works for some people, but for the Golden Girl-in-Chief, objects are like friends: There’s always room for one more. Clockwise from top left Erin and her husband, Ben, met through a friend on Myspace. (“It’s the most embarrassing story we love to tell people,” she laughs.) Her shop, Golden Rule, stocks art, apparel and gifts, much locally made. Her Excelsior home highlights treasures such as framed song lyrics her dad wrote for her before she was born and a collection of vintage dishes and Fiesta dinnerware in the kitchen. Gazing at the display: one of Erin’s many vintage oil portraits of women. In the living room, Erin’s son, River, rocks with Sufjan Stevens—the dog, not the singer-songwriter. Behind him, a white Ikea pedestal table (the kind Erin uses to display jewelery in her shop) offers an extra surface for kids’ books and mementos. 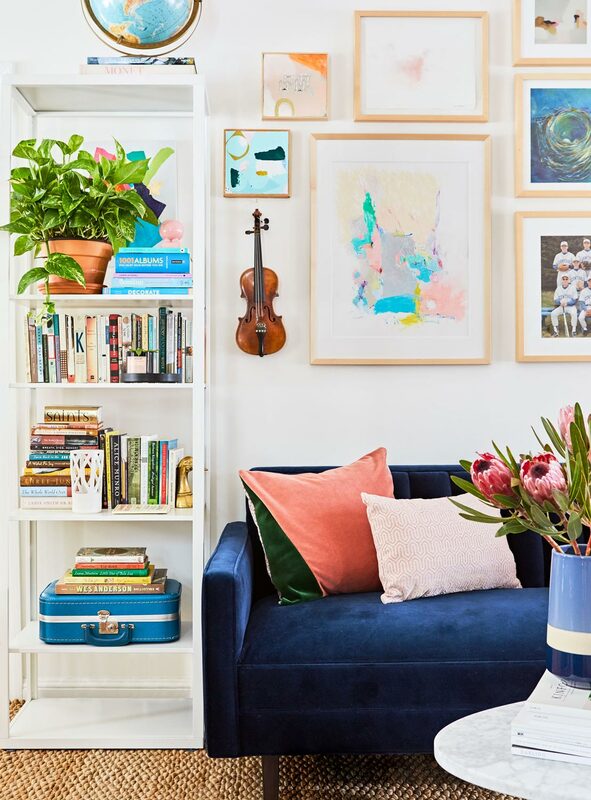 Another shop favorite that found its way home: jewel-tone velvet. 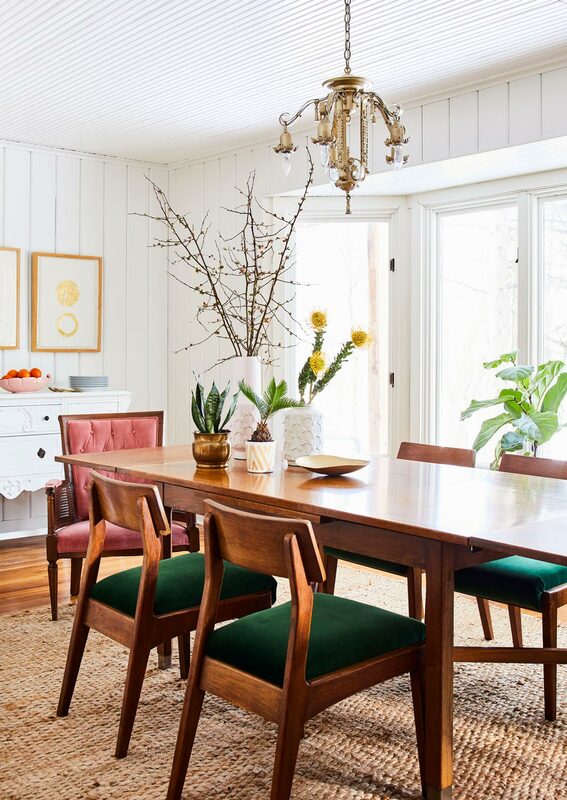 Erin sells cushions in the affordably luxe material, and she used it on both her Room and Board living room furniture (above) and also her Craigslist-sourced midcentury dining set (below). 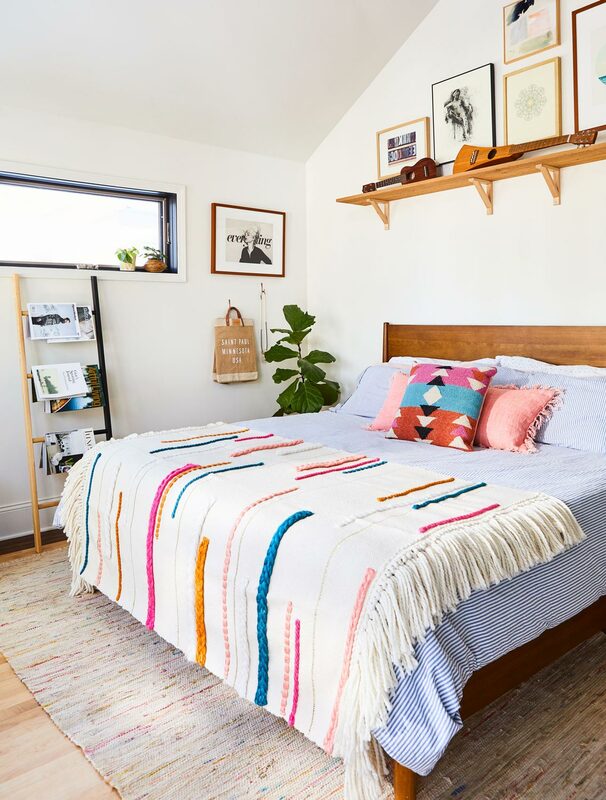 Upstairs, the master bedroom leans more neutral, “to give our eyes a breather from all the color on the main floor,” Erin explains. Erin carved out a wedge of gallery space by the turntable under the stairs. River and Lillian hang in his bedroom, where Erin has assembled art that’s age-appropriate but not juvenile. That room wears a soothing pale blue. Downstairs, the kitchen takes a bolder turn. 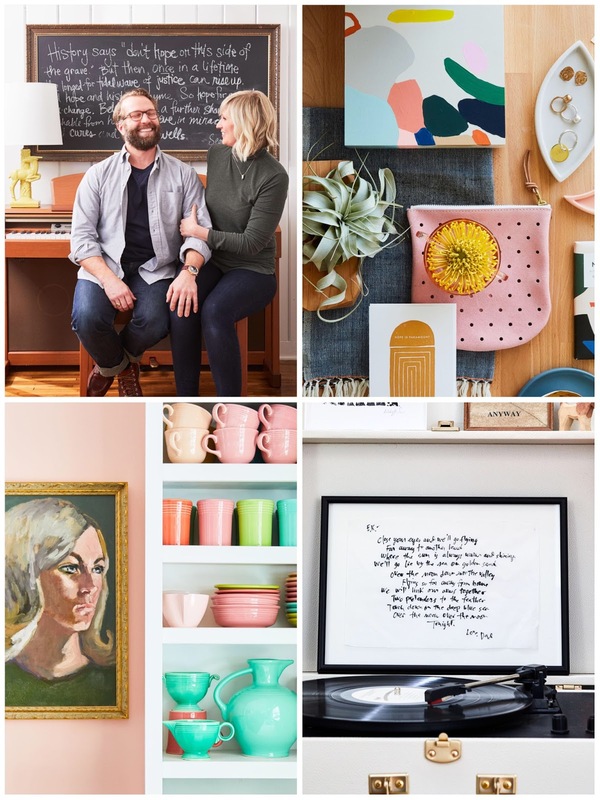 “Ben came home one day to the kitchen I just painted and said, ‘Oh, we’re doing pink now? OK,’” Erin says of her penchant for change.